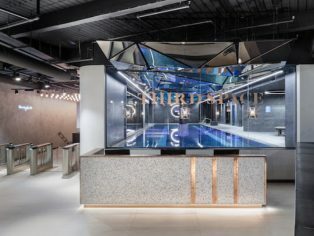 Studio RHE have completed its £5m fit out of a luxury Health Club in the City of London for Third Space. The 27,000 sq ft space spans the ground and basement floors of ‘Minster Court’ the neo-gothic, post-modern office building. It features a range of high-end leisure facilities, including a 20m swimming pool and accompanying spa, mind and body studio, treatment rooms, café and changing rooms, as well as extensive back of house areas. 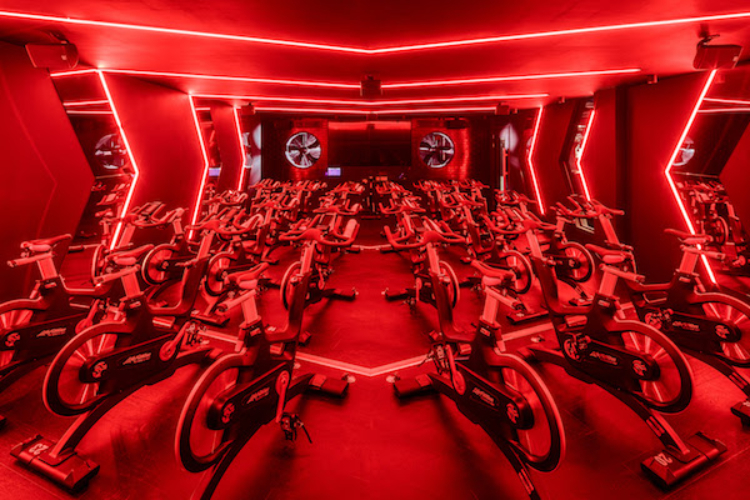 Innovative installations on the gym floor include a training rig and athletic track; spin studios, High Intensity Interval Training (HIIT) studio, combat area, a dedicated free weights area and altitude chamber. 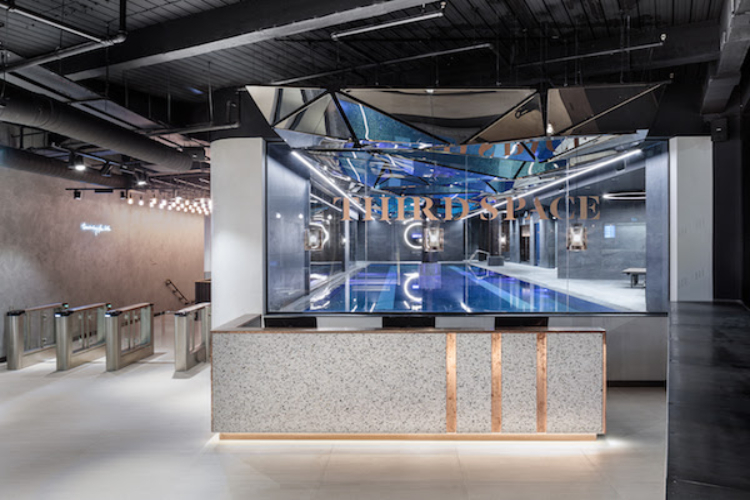 The Third Space City Club combines serious training with a sophisticated, boutique aesthetic, with both raw and polished concrete and copper sheet used throughout. 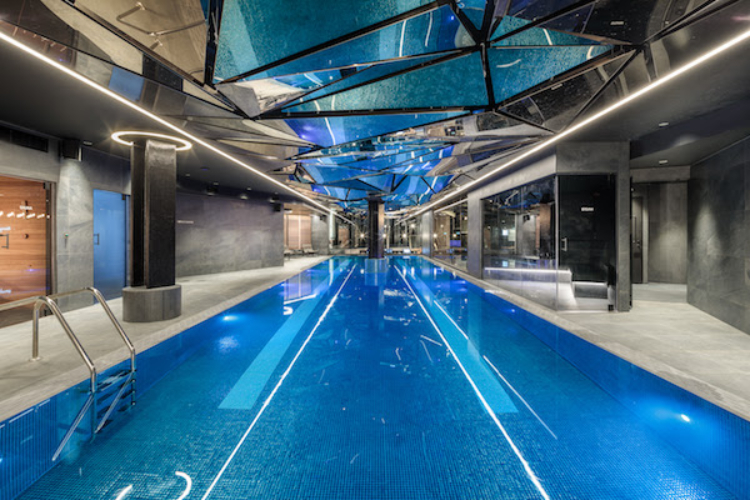 Studio RHE developed a bespoke 3D modelling system to aid the complex engineering of the tessellated copper effect ceilings in the Reception area and swimming pool. The ceiling comprises laser cut and folded steel panels, which are stained copper and polished to provide a mirror effect. The Reception area features a statement welcome desk, made of an off-white terrazzo composite featuring white, black and orange stone reflecting the colour palette used throughout the Club. Large external windows allow light to flood into the Reception area, with internal windows allowing light through into the pool area beyond. A combination of pendant lights, spotlights and wall mounted fixtures provide dramatic lighting effects across all of the subterranean spaces. Studio RHE were keen to embrace the complexities and eccentricities of the original building, resulting in exposed steel columns, services, cornices and brickwork, with the varying ceiling and floor levels celebrated rather than concealed. 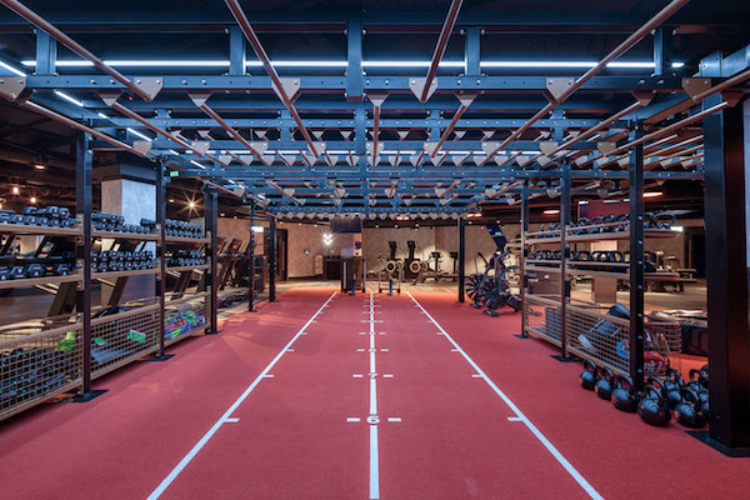 The design further develops the revolutionary approach to Health Club design that Studio RHE piloted in 2003 when it created the first Third Space in Brewer Street, Soho. Previously gyms were typically a series of enclosed, siloed and poorly connected spaces. Studio RHE’s novel approach, drawn from its expertise at creating hospitality spaces, opened up the key individual spaces by positioning them on different levels, with internal glazed screens and transparent floors allowing visitors to look through from one space to another. This is the latest design completed by Studio RHE with recent developments across London, including a much-lauded cycle ramp and basketball court at its award-winning ‘Alphabeta ‘office building in the City of London. Studio RHE has also been responsible for creating extensive leisure facilities and luxury Hotels and Resorts around the world, most recently at Six Senses Zil Pasyon in the Seychelles, recently voted Best Resort Hotel in the World.